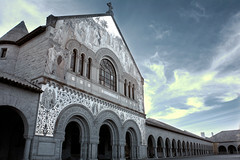 This is Memorial Church, or MemChu, at Stanford University. My wife and I had hoped to renew our vows there this year. It’s only been 5 years, but for a lot of reasons we felt it was a pretty big deal and wanted to do something special. We actually haven’t even celebrated our anniversaries yet. One can get married or renew vows at MemChu only if one is a student or an alum (I’m the latter). When I first got married, I have to admit that I was torn between MemChu and the outdoor venues we were considering. MemChu really has a special place in my heart. When I was stressed, even though I am not at all religious, I used to go to MemChu, sit down in a pew, and reflect on things. I used to laugh out loud as I rode my bike or walked past the church, not believing that I could go to a school so wonderful and beautiful. But MemChu doesn’t have many wedding-level reception venues near it, and between that and the church’s fees as-is, we couldn’t afford it. So we were hoping to celebrate entering this next phase of our lives together at the church. It would be a bookend, in many ways, to things, moving from a trouble freshman dealing with all the issues of…being a freshman to celebrating 5 years into my wonderful life with my wife. Well. The church has an opening the morning the day after our anniversary (a Saturday). The coordinator was incredibly friendly and energetic and seemed to be someone with whom I would want to work. But they usually only allow renewals of vows after 20 years, and the Dean of Religious Life understandably turned down our request for an exception. 15 years is a long time, and my feelings about Stanford (having left there after 12 years as a student and employee) and the church make the situation just a bit more disappointing.